Slab leaks left undetected can cause major damage to your home. When left for long periods, moisture can lead to mold growth and mildew in flooring and walls increasing the cost of repairs and remediation. Wet spots and moisture are one of the most common sign homeowners discover leading them to suspect a slab leak, but these signs can also indicate that the leak has been happening for some time. Slab leaks occur in the either the hot or cold copper water pipes under the slab, not in the slab foundation itself. The copper lines develop small holes over time for a number of reasons, and once the copper pipes are compromised, water will begin to seep out. 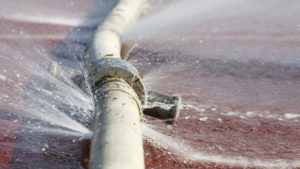 Typically, leaks begin slowly and water will work its way up through the foundation. Once homeowners notice signs of slab leaks, slab leak detection should be performed immediately to prevent further damage. What are Signs Homeowners have a Slab Leak? Homeowners can detect early leaks by monitoring their water usage and water bills. Even the smallest leak can affect how much water homeowners use. When comparing normal use against previous months, homeowners can determine if there is a discrepancy. When there is a fluctuation that does not seem comparable to water actually used, a leak is the most likely cause. If homeowners notice a huge spike form one month to the next, it is good practice to look for other signs throughout the home such as warm spots on tile or hardwood, damp spots on carpeting, fluctuations in hot water pressure, and water running sounds when the water is off at every tap. The sound of a leak coming from the toilet is easily noticed as it is something homeowners use every day. However, slab leaks can also emit the sound of running water if homeowners listen closely. If homeowners suspect any kind of leaks, or notice a change in their water bill, they can turn all taps off within the home and go through the house listening for the sounds of water running. Because slab leaks are caused by pressurized water lines under the foundation, it might be hard to detect without knowing what you are listening for. The sound can also be deceiving, as it may sound like the water is running inside of the walls instead of under the foundation. At the first sound of water running, homeowners should contact a professional plumber to perform leak detection in case it is a leak in the copper water lines under the slab foundation. Have you ever been in the shower when all of the sudden the water pressure drops or turns cold for an instant? This can happen for many reasons, but one of them may indicate an early sign of a hot water slab leak. When the pipes develop a leak under the slab, the water flow is disrupted and creates pressure fluctuations as it is being sent to fixtures such as showers and faucets. Water pressure drops and hot water fluctuations can vary for a few seconds or be ongoing. There are more signs of a slab leak that indicate the leak may have been happening for some time. If homeowners notice any of these signs, they should contact a professional plumber as soon as possible. Pets are surprisingly helpful at detecting slab leaks. House cats and dogs are habitual animals and tend to have favorite napping spots throughout their home. Paying attention to your pet’s favorite spots can be telling if all of a sudden, they are choosing new places to settle in and are spending a lot more time there. When a hot water pipe is leaking under the slab, it will essentially warm the concrete foundation and the heat rises to the surface creating the perfect spot for cats and dogs to curl up and get cozy. 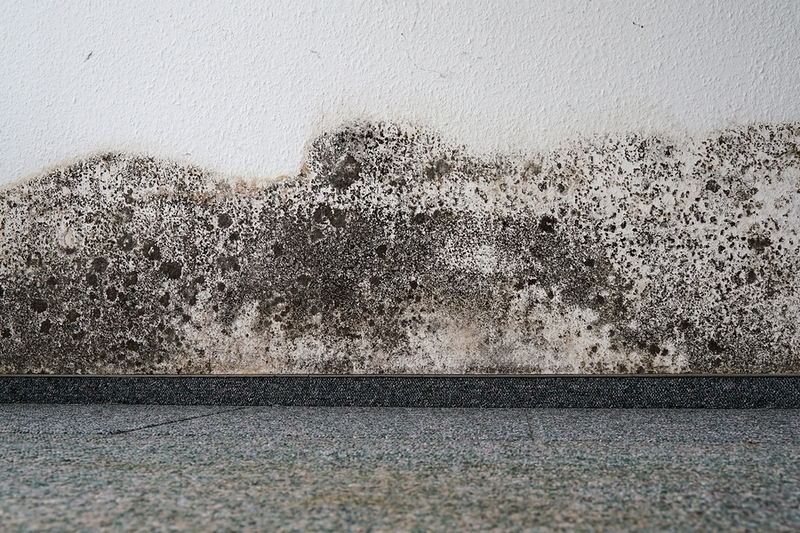 Mildew smells and mold growth typically indicates a leak has been ongoing for some time. Likely, it began as a slow leak and the moisture went unnoticed allowing for the growth of mold. Often, homeowners miss early signs of a slab leak and the appearance of mold along the baseboards and walls is a sign to call a professional slab leak specialist. Homeowners can be proactive in leak detection by periodically checking along the baseboards throughout their home and in closets for any signs of growth. Like warm spots on hardwood and tile, damp carpeting is a clear indication of a slab leak. Because there is no substrate blocking the water like tile or hardwood, the water leaks under the slab can eventually saturate carpets above the general spot of the pipe leak. Slab leaks are more likely to happen in older homes, but any home with copper water lines under the slab are susceptible to slab leaks. High water pressure is one of the most probable causes of a slab leak. When the water pressure coming into the home is too high, it creates expansion and contraction of the water lines and the pressure has to escape somewhere. As the pipes under the foundation expand, they rub against the concrete and the friction can cause the pipe to wear down over time. In San Diego, corrosive soil can add to friction slab leak causes as it is more abrasive and acts to quicken the deterioration of the copper water lines under the slab foundation. Foundation shifting from natural settling and earthquakes will also contribute to this as a factor of slab leak causes. All causes of a slab leak generally take years to do any real damage, so older homes are typically at a higher risk. The best method to catch a slab leak early on is vigilance. Homeowners can set up a monthly schedule to check all fixtures, monitor water bills and usage against the previous month, and look for signs of moisture throughout their home. Homeowners should also note any signs of previous leaks such as corrosion around water fixtures and water lines at the water heater. This is a good indication of high water pressure spikes that can eventually lead to a slab leak. Once a homeowner suspects a leak, a professional plumber can pinpoint the exact location and provide the best option for repair and water damage remediation. Slab leak detection does require specialized equipment and knowledge to ensure the exact location is correct; being off by even a small amount can change the repair options and end up costing homeowners more money and time. Slab leaks are not completely preventable, unless homeowners decide to eliminate all water lines under the foundation and have their home repiped. This is a costly option and typically not covered by homeowner’s insurance. However, there are some ways to lessen the likelihood of a slab leak. Homeowners should regularly monitor their water bills against normal usage and note any variations. Homeowners should ensure they have a pressure regulating device installed and set at a safe pressure between 50 and 75 PSI. Fluctuations in pressure can cause small leaks such as fixture drips and toilet’s running, so any small issues can indicate high water pressure that should be taken care of immediately. Any fluctuations in water usage and pressure can indicate something is happening. If caught early, it could mean the difference between a small repairable leak, and a slab leak that has the potential to cause major damage and costly repairs. There are several options for repairing a slab leak. The most common and quickest repair will be a direct slab leak repair through the foundation. Direct slab repairs take less time and are covered in part by homeowners insurance; typically, they will cover a portion of the damage and reconstruction repairs. However, direct slab leak repairs only fix the current leak. If a section of pipe has developed a leak or has been compromised, the likeliness of another part of the pipe in a différent location leaking becomes higher. Slab repiping is when the plumber eliminates the leaking line in the slab foundation and repipes up through the walls, garage, or exterior of the home. This eliminates all future leaks on the rerouted line only. Insurance sometimes will cover the location service, but rarely covers the actual reroute. Whole house repiping is the costliest option for eliminating a slab leak, but it is the only option to prevent all future slab leaks. Repiping eliminates all water lines in the slab and re-pipes the lines throughout the home. Plumbers can prove free estimates for whole home repiping, but homeowner’s insurance does not cover slab repiping. Homeowners can also choose partial home repipes or rerouting of the copper water lines under the slab to prevent leaking form certain lines. This is less than a whole home repipe and depending on where the leak is under the foundation, some homeowner insurance policies will cover a partial reroute or repipe. To avoid costly damage and headaches, it is best to address slab leaks the moment a homeowner notices the first sign. Being aware of how slab leaks work and what causes them provides the best tools to detect leaks early. Call 1-800 Bill Howe (245-5469) and the professional slab leak repair specialists at Bill Howe will offer a one-stop solution for detection, repair, and remediation.